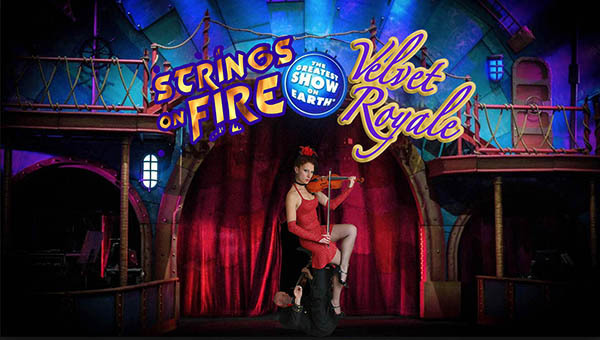 Imagine the thrill of a Circus show, with traditional tricks like Juggling, crowd-pleasing Hula Hoops (incorporating a unique spin with Hula Fiddle), breathtaking Rola-Bola wobble board, Acrobalance, Equilibrium and all a full range of Fire Artistry… and then add the excitement of live violin and cinematic backing tracks… Totally UNIQUE! Presentation can be themed closer to Circus or to Sideshow. This show has been performed at many events, including as a feature performance for NRMA, Bungalow 8 & Cirquinox and roving spot-show presentations for South Australian Tourist Commission & IBM. Fire, candelabras, violins, cirque style stunts, a touch of Tango… the duo were born for this! Musical soundtrack includes Vivaldi’s most famous pieces, Carmen, dark cirque and atmospheric ball music. They have performed this show at many events including Maserati, Finity & Harvey World Travel. This show includes compelling material from Nellie’s Bed of Nails Show, combined with the duo’s darkest presentation to give your event a macabre and Gothic (but totally FUN) feel! Picture a Gollum-like Finhead wielding knives, balancing a sword on the tip of a knife held in his teeth, and lying on a bed of nails to the spooky strains of Mare’s haunting violin! Be shocked when she climbs on top of his undead body lying on the nails! And she never stops playing…. showing no mercy! The show features all of the duos most extreme stunts, Tango, darkest music and vampyric presentation! Comic or serious presentation is your choice. Has been performed at many events, including Toll Express, Oxford Printing & Prima Nocta. With exquisite Arabian costuming, this show is a real crowd pleaser. It opens with a cinematic groove-driven version of Lawrence of Arabia with live violin and Arabian choreography. Features include Arabian knife juggling, Sword routines, Belly Dancing, Fire Eating and Body Burning, culminating in an exotic Bed of Nails performance straight from Araby! Strings on Fire’s Arabian Show has been performed at many events, including Gadens Lawyers, the Catholic Aged Care Ball, P&O and Princess Cruises.